NPSTC's Governing Board Hosted a Meeting by Teleconference on January 10. 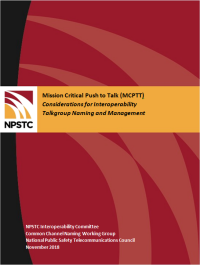 The Board approved a new report from the Common Channel Working Group,Mission Critical Push to Talk (MCPTT): Considerations for Interoperability Talkgroup Naming and Management. The report lays out a series of nationwide considerations on how to manage MCPTT talkgroup names. MCPTT communications technology is evolving and promises to provide public safety with a rich set of features and capabilities that leverage the full extent of the Nationwide Public Safety Broadband Network (NPSBN). The report examines how interoperability may occur when public safety personnel travel outside of their home service area. There are a number of new and innovative ways in which talkgroups can be created and shared. Those features also create the need for more policy, procedure, training and collaboration. The report includes recommendations and makes several observations regarding how interoperability should be coordinated and the need for a common naming scheme to identify designated interoperability talkgroups. The report was created following the earlier fall publication of Mission Critical Push to Talk Considerations for the Management of User ID and First Responder Identity. The report, developed by the LMR LTE Integration and Interoperability Working Group, provides high-level recommendations on the potential use of various MCPTT data fields to create a standardized approach to managing first responder identity. The nationwide coverage provided by the NPSBN will allow public safety personnel using MCPTT to communicate with almost any other agency, including those far removed from their traditional service area. Personnel providing mutual aid or traveling through another agency's service area may need to request urgent assistance or request additional information about their assignment. A key component of first responder safety is the ability for the PSAP to immediately determine the identity of those users, especially those in distress. NPSTC Working Group Reorganization. The Governing Board approved the closure of the UAS and Robotics Working Group, as this group has completed its goals and objectives. Future issues will be discussed at the Committee level. The Video Technology Advisory Group (VTAG) has completed its current goals and objectives, and likewise, has been placed into monitoring status. Both the Common Channel Naming Working Group and the Radio PCR Working Group have met their goals and objectives as well and will also be placed in a monitoring status until the next National Interoperability Field Operations Guide (NIFOG) update or FCC action. Kevin McGinnis has been appointed Chair of the EMS Working Group, as Paul Patrick assumes a new role on the FirstNet Board. Presentation from CTIA. Matt Gerst, Assistant Vice President, Regulatory Affairs, discussed CTIA's work to provide better tools for wireless 9-1-1 location accuracy. CTIA focuses on policy, testbeds on location solutions, and the National Emergency Address Database (NEAD). Mr. Gerst discussed the adoption of device-based hybrid (DBH) solutions, which have worked very well in their testbeds. The solution aligns 9-1-1 location technology with commercial location technologies, he said, in the same manner as ride-sharing or map applications. He said that all four nationwide wireless carriers planned to deploy DBH location technology solutions. He also announced CTIA and national wireless carriers now want the FCC to adopt the z-axis 9-1-1 indoor location accuracy standard to provide certainty to the requirement, rather than waiting for additional testing, as the industry had previously suggested. Public safety entities, including NPSTC's members, previously expressed their opposition to a proposed 5 meter accuracy level and delays through further testing, saying that more precise accuracy is crucial and possible. Please Join Us on January 17, from 2:00 to 3:30 p.m. ET, for a Town Hall Session on Datacasting for Public Safety. Datacasting can provide increased situational awareness and data transfer between agencies. Datacasting is the ideal method to deliver large amounts of streaming data like video to a large number of people without overloading the local cellular network. This Town Hall presentation will focus on several new applications and capabilities, including how the State of California is testing an advanced earthquake early warning detection system, how Adams County, Indiana, is enhancing school safety, and how the City of Houston leveraged video and data transfer during the Super Bowl and Hurricane Harvey.